Current Status: merged into Rural Lodge, 01/23/2004. By Wor. Eugene F. DeNormandie. During the last decade of the nineteenth century that part of Quincy commonly referred to as Wollaston or Wollaston Heights was making very material growth in population. It did not require any unusual gift of prophecy or the power of divination to foresee that as a community it was destined to occupy a position of constantly increasing importance. As new families took up their abode in this locality it came to be known to those interested in Freemasonry that some of the members of those families were Masons in good standing who, for divers reasons, did not become affiliated with Rural Lodge, which was then the only Lodge in existence in this city and whose exclusive jurisdiction extended from the Neponset River to the southerly boundary line of the town of Braintree. This jurisdiction had approximately three times the average population of the Masonic Jurisdictions as then established by the Grand Lodge of Massachusetts and considerably less than the average Masonic membership. In a desultory way the desirability of having a Masonic Lodge in this locality was discussed from time to time by those who were interested in Masonic activities, but the project did not crystallize until the last five years of the nineteenth century. It is the general consensus of opinion among those who were active, both for and against the proposed movement, that the first petition prepared was never presented to Rural Lodge for formal action thereon. There was well denned and active opposition to the proposal and some of the petitioners were frankly told that it was useless to expect favorable action on the part of Rural Lodge. After the lapse of more than twenty-five years it is my deliberate judgment, now publicly expressed for the first time, that Rural Lodge was amply justified by later events in taking the attitude it did relative to the first abortive attempt to establish a Masonic Lodge in Wollaston. "Petition received from thirty-two Masons in good standing asking for a Dispensation from the Grand Lodge and the permission of Eural Lodge to form a new Lodge at Wollaston. Laid over until the next Communication. "The petition for forming a new Masonic Lodge at Wollaston was brought before the Lodge for action. Wor. Bro. John Neil having received permission of the Lodge to speak on the subject, presented the case of the petitioners. He was followed by Bro. E. E. Jameson, Bro. E. F. DeNormandie and others. It was moved that the request of the petitioners be granted, and after some discussion a ballot was taken with the following result. Total vote 85. In favor of the petition 40, against 45, and the motion was lost." "Bro. DeNormandie gave notice that he would move for reconsideration of the vote at the next Communication. Bro. DeNormandie moved a reconsideration of the vote whereby the Lodge voted against the petition for a new Lodge at Wollaston. The motion was lost 20 in favor, 22 against. Petition received from thirty-eight Masons in good standing asking permission of Rural Lodge to form a new Masonic Lodge at Wollaston, laid over until the next communication. "The petition for a new lodge of Master Masons which was presented at the lust regular communication was brought before Lodge for action. On motion of Rev. Bro. Ciathern it was voted that the petitioners be granted the privilege of the floor. Remarks in favor of the petition were made by Brothers DeNormandie, Swartwout, Bryant, Hatch, Keating and Crathern. The motion was made that the petition be granted. The Master appointed Wor. Bro. Whiton, Bros. DeNormandie and Sprague a committee to collect, sort and count votes. Whole number votes cast 63, in favor 46, against 17, and the request of the petitioners was granted." By the favorable action of Rural Lodge as set forth above the last vestige of opposition to establishing a Masonic Lodge in Wollaston was removed and some of those who were most active in opposition became avowed well-wishers. In accordance with the procedure prescribed by the Grand Lodge, the petition was approved by Rt. Wor. Bro. Charles B. Lawrence, D. D. G. M. for the Twenty-fourth Masonic District, who also recommended that a Dispensation be granted. with permission to hold the same in Wollaston District of the City of Quincy, in the County of Norfolk and Commonwealth of Massachusetts. And whereas said petitioners have been recommended to me as Master Masons, in good standing, by the Worshipful Master, Wardens and Brethren of Rural Lodge, holden in Quincy, and their petition having been countersigned and approved by our District Deputy Grand Master for the Twenty-fourth Masonic District. Therefore I, Charles Carroll Hutchinson, Grand Master of the Most Worshipful Grand Lodge of Massachusetts, reposing full confidence in the recommendations aforesaid, and in the Masonic integrity and ability of the petitioners, do by virtue of the authority of my office, and of ancient Masonic usage, hereby grant this Dispensation, authorizing and empowering our trusty and well-beloved brethren aforesaid, to form and open a Lodge after the manner of Ancient, Free and Accepted Masons, and therein to admit and make Free Masons, according to the ancient custom, and not otherwise. And this Dispensation is to continue in full force until the Quarterly Communication of the Grand Lodge aforesaid, to be holden in the City of Boston in the month of December, A.D. 1899, A.L. 5899, unless sooner revoked by me or by authority of the Grand Lodge. And I do hereby appoint Brother John F. Neill to be the first Master, Brother Albert W. Fay to be the first Senior Warden, and Brother Eugene F. DeNormandie to be the first Junior Warden of said Lodge. And it shall be the duty of said Master and Wardens and their associates, and they are hereby required, to return this Dispensation, with a correct transcript of all proceedings had under the authority of the same, together with an attested copy of their By-Laws, to our Grand Lodge aforesaid, at the expiration of the time herein specified for examination, and such further action in the premises as shall be deemed wise and proper for the general interests of the Craft. Given under our hand and the Seal of our Grand Lodge aforesaid, at Boston, this second day of January A.D. 1899, A.L. 5899. Attest: Sereno D. Nickerson, Recording Grand Secretary. And now, the long-sought Dispensation in hand, we realized that our serious work had just begun. It was necessary to raise funds properly to equip a Lodge-room, to determine upon a place of meeting, and to do the other many things that had to be done before the first communication could be held. There were many willing helpers among the petitioners and these rendered valuable service. Even so the great preponderance of the work to be done fell to the lot of the Master and Wardens. Wor. Bro. John F. Neill, Master U. D., was indefatigable in his efforts to have the Lodge-room suitably arrayed. On January 10, 1899, just eight days after the Dispensation was signed by the Most Worshipful Grand Master and the Recording Grand Secretary, the petitioners were called together for the first regular communication of Wollaston Lodge. The place of the first meeting was Odd Fellows Hall on Newport Avenue. The regalia, rods, and aprons were loaned by The Massachusetts Lodge, of Boston, of which Wor. Bro. Neill was a Past Master. A table served as the altar. The Great Lights were borrowed for the occasion. The Lesser Lights were of a very temporary character. The credentials of all of the petitioners were duly examined and a full list of officers, other than Master and Wardens, was appointed by the Worshipful Master. These officers at the request of the Master assumed their respective stations without the usual installation ceremonies, and Wollaston Lodge was ready to transact such business as could properly come before it. The first business transacted was the presentation of fifteen applications for degrees. To those of you who have been receiving notices of meetings for the past few years, this may not seem a very large number to be presented at one meeting, but for the year 1899 it was almost a phenomenal number. It meant, if all the applications were accepted, that we had a full year's work before us and it proved to be a true index of the very great interest aroused by the founding of a Masonic Lodge in this community. "That the Secretary be paid a salary of fifty dollars yearly, to be paid quarterly." Thus early did we realize that the Secretary of Wolla-ton Lodge was destined to have a large amount of work as his portion. During the past ten years this work has been very onerous. I am pleased to record that the compensation for this work has been increased from time to time, but even so the amount paid is a small return for the time and attention that the Secretary must devote to the duties of his very important office. At the second regular communication it was shown conclusively that Wollaston Lodge had a goodly number of real friends. The Lodge-room presented a very different aspect from that shown at the first meeting. New regalia, aprons, and other paraphernalia had been purchased. An altar of dark cypress had been made for us by tin' A. T. Stearns Lumber Company at nominal cost. The Great Lights, which are still in constant use in this Lodge-room, were presented by Mrs. John F. Neill. wife of the Master U. D., and Mrs. Smith B. Harrington, wife of our Wor. Bro. Smith B. Harrington, who was probably more widely known in Masonic circles than any other of our members, he having served as Grand High Priest of the Grand Chapter of Massachusetts. He also served Wollaston Lodge as its Proxy to the Grand Lodge during the administration of Wor. Bro. Albert W. Fay. The metal cylinder for the preservation of the Charter which we hoped to receive in due course of time was donated by Bro. George D. Burgess, of Metropolitan Lodge of New York. It was first used to contain the Dispensation. It is still in use as the resting place of our Charter and will probably be so used, barring accidents, at our Centennial Anniversary. The Records book, Visitors' Register, By-Laws book, and Ledger were donated by Bro. Robert S. Jones of Wollaston. The three white marble slabs for the Pedestals were given by Bro. James C. Bates, then Secretary of The Massachusetts Lodge, who was always deeply interested in the welfare of this Lodge and whose son later served it as its Worshipful Master. The Rough Ashlar and Perfect Ashlar were donated by Brothers Swingle and Falconer. The electric wiring for the Lesser Lights was installed by Bro. J. P. Bubert without cost to the Lodge. Substantial gifts of money were made by Bros. Eugene H. Sprague, Charles M. Bryant, Walter J. Wellington, and Wor. Bro. Henry O. Fairbanks, all members of Rural Lodge, of Quincy. The Working Tools were presented later by the wives of the Charter members. All of these gifts were suitably recognized by votes of thanks duly passed and recorded. The second regular communication, which was the first at which degree work was done, was held February 14, 1899. The Entered Apprentice degree was worked on five candidates elected at the same meeting. The Worshipful Master was assisted in the work by Wor. Bro. Henry O. Fairbanks. Past Master of Rural Lodge, and by Wor. Bro. Henry L. Kincaide, who was then the Presiding Master of Rural Lodge, each of whom received a candidate. In this manner, by assisting in the work at the earliest possible moment. Rural Lodge showed its kindly interest in and friendly feeling for Wollaston Lodge. At the third regular communication held the following month, the Worshipful Master announced in open Lodge the sudden death of Rev. Bro. James Edwin Bagley, who was at the time of his admission into the Masonic Fraternity pastor of the Unitarian Church in Wollaston. Brother Bagley was one of our most enthusiastic and promising candidates. He had long anticipated keen enjoyment upon becoming affiliated with the Freemasons. How well I remember his cheery salutations and invariable inquiries, as to when the "New Masonic Lodge would be started in Wollaston." For months he had it in mind to be the first to apply for admission among us. His wish was granted. To my way of thinking Brother Bagley holds a distinction that is unique. I doubt if there is a parallel in all the annals of our time-honored Institution. He was the first candidate to ask for and sign an application for admission to membership. His was the first application to be received, read, and balloted upon in the Lodge to which lie applied. He was the first candidate ever received and initiated in that Lodge. He was the first candidate accepted by that Lodge and he was the first to be gathered to his fathers. For some reason to us unknown he was permitted to see the Great Lights of Freemasonry only in the first position. A committee, consisting of Wor. Bro. Smith B. Harrington and the Wardens of the Lodge, was appointed to draft resolutions upon the death of Brother Bagley and a page was set apart to his memory. This Memorial, which was written wholly by Wor. Bro. Harrington, is so fine, so well expressed and so appropriate to the occasion and the circumstances, that I give it in full. Therefore be it resolved, That in the sudden and untimely death of Brother James Edwin Bagley, the community and the Masonic Fraternity have suffered a great and irreparable loss. He was by nature a true Mason and a loyal friend, singularly approachable, frank and open as the sunlight, so warm-hearted, kind and sympathetic that he found a way to our hearts immediately. He honored us by being the first to seek brotherhood among us. God has honored him by first calling him to a higher duty. May we long cherish his memory and emulate his noble manhood and brotherly qualities. But wheresoe 'er God hides him, it is well. At the fifth special communication, we had as invited guests twenty-nine members of the First Worshipful Masters Association, who came from Boston in a special car attached to the 7.38 train from the South Station. Wor. Bro. Neill was a member of this Association. It was a gala occasion. The Secretary's records show that one hundred and ten brothers were present. This goodly number taxed our meagre accommodations to the utmost. The work of the evening was the Master Mason degree. On Saturday, May 1-3, 1899, the Lodge held its first Ladies' Night, which was attended by about eighty-five ladies, Brothers, and friends. An entertainment was provided and it proved to be an enjoyable occasion. At the seventh special communication remarks were made by Wor. Bro. Neill with reference to a new building for Wollaston Lodge, so you see, Brethren, that from the earliest days of Wollaston Lodge we had it in mind to provide a Masonic Temple adequate for the requiremeats of Wollaston Lodge and suited for its use. At the sixth regular communication a Committee was appointed to draft a code of By-Laws and submit the same to the Lodge. This was done and later our By-Laws, as adopted, were submitted to the Grand Lodge for approval. The Grand Lodge approved them without modification. In a large degree the present material prosperity of Wollaston Lodge is due to the original provisions therein contained relative to a Permanent Fund. Owing to exigencies which arose after the completion of the Wollaston Masonic Temple, the restrictions applying to the Permanent Fund were somewhat modified. At the earliest practicable moment they should be restored. The total receipts from all sources for the period that this Lodge was under Dispensation, including donations, was $1,895, of which sum $275 was returned to applicants, and we closed the period with a cash balance of $421.83. So it would appear that the activities of the Lodge while under Dispensation had been financed on the meagre sum of $1,198.17, notwithstanding the fact that we were obliged to purchase the necessary regalia and other furnishings. Had it not been for the generosity of our friends our balance would have been less. During the period under Dispensation we initiated twenty-one, passed and raised eighteen, rejected six; the applications of two were not in proper form and were therefore never balloted upon. The status of those who had been made Master Masons was that of non-affiliated Masons in good standing. They could not become members of Wollaston Lodge until after the Lodge was Constituted and they had signed the By-Laws. The date set for Constituting Wollaston Lodge was January 2, 1900, exactly one year after the date of the signing of the Dispensation by the Grand Master. The elective officers had been chosen. The Junior Warden-elect, Bro. Denton K. Swartwout, who had served most admirably as Senior Deacon U. D. resigned, as a contemplated change in his business activities would necessitate his being permanently located in the Middle West. The vacancy thus created had to be filled by an election. At three o'clock in the afternoon on January 2, 1900, the Charter members were hurriedly assembled. At this meeting Bro. Albert H. Sayward was unanimously elected to serve as Junior Warden. On January 2, 1900, the second day of the twentieth century, at four o'clock in the afternoon, Wollaston Lodge was duly Constituted with full ceremonial by Most Worshipful Charles T. Gallagher, Grand Master of Masons in Massachusetts, assisted by the other officers of the Grand Lodge, and the officers-elect of Wollaston Lodge were duly installed. The Charter was then presented and Wollaston Lodge began its career as a duly constituted Lodge with thirty-six Charter members. After the ceremonies of Constitution and of Installation, a banquet was enjoyed by the members and their guests after which the Lodge reassembled at eight o'clock to hold its tenth regular communication, which was its first as a duly constituted Lodge. The first official visitation of Wollaston Lodge was made at the seventeenth regular communication, October 2. 1900, by Right, Worshipful Brother Charles F. Mann, D. D. G. M. for the Twenty fourth Masonic District, The work exemplified was the Fellow Craft degree. The twenty-fifth regular communication, held June 4, 1901, was in some respects notable. Five Brothers were raised and nine applications for degrees were received. This was an unusually large number. Ten Past or Presiding Masters were present as guests. A gold bar. to be attached to his Past Master's jewel, the gift of the Lodge, was presented to Wor. Bro. John F. Neill by Wor. Bro. Smith B. Harrington. At the eleventh special communication, held September 17, 1901, appropriate remarks on the life of Bro. William McKinley, late President of the United States, were made by Rev. Bro. Edward A. Chase. In the early autumn of 1901, less than two years after completing his term as Worshipful Master Under Dispensation, Wor. Bro. Neill died. He was a member of The Massachusetts Lodge, St. Paul's Royal Arch Chapter, and DeMolay Commandery, K. T. A page in the Records of the Lodge is set apart to his memory. At the thirteenth special communication, November 19, 1901, we had a number of distinguished Masons as guests who assisted in the work of the Master Mason degree. They were R.W. Bro. W. H. H. Soule, Past Grand Warden of the Grand Lodge of Massachusetts; M. W. Bro. Nay, Past Grand Master of the Grand Lodge of Vermont; R. W. Bro. Remington, Junior Grand Warden of the Grand Lodge of Massachusetts, and R. W. Bro. Sereno D. Nickerson, Recording Grand Secretary of the Grand Lodge, who delivered the charge. At the second annual communication, Wor. Bro. Fay was elected Proxy to the Grand Lodge, which position, as the senior Past Master of the Lodge, he held without interruption so long as he lived. The question of more suitable quarters for a place of meeting was ever before us and at the second annual meeting the "Organ Committee was instructed to look into the matter of new and better quarters for the Lodge." Early in the administration of the second Worshipful Master a rather unusual event occurred. A friend of Rev. Bro. Rufus B. Tobey had made the request to be buried with Masonic rites. As this Brother was at the time of his demise a non-affiliated Mason, Brother Tobey naturally turned to the officers of his own Lodge to grant the Brother's last request. Accordingly a special communication of Wollaston Lodge was held, without notice, at 2326 Washington Street, Boston, for the purpose of conducting the funeral services of Brother William Clarke Wing, formerly a member of Aurora Lodge, of Fitchburg, Massachusetts. At the November meeting in 1902 a telephone was installed for one night in the ante-room, and the election returns were received and read by Bro. Charles G. Lee, who was one of our most active and progressive members. He was keenly interested in the question of a Masonic Temple and it is safe to say that had he lived Wollaston Lodge would have been equipped with a new building several years before the present Masonic Temple was erected. At the annual meeting on December 2, 1902, an unusual ceremony was exemplified. It had been brought to the attention of the Worshipful Master that the son of one of our members had been clandestinely initiated, passed, and raised, by one of the Lodges within the jurisdiction of the Grand Lodge of Massachusetts. When this Brother, unsuspectingly, attempted to visit Rural Lodge, one of the Past Masters of that Lodge raised the question of the legitimacy of his Masonic membership, and he was debarred from visiting that or any other Lodge for several years. The matter was brought before the Grand Lodge and a Dispensation issued, empowering the District Deputy Grand Master to heal the Brother within the body of Wollaston Lodge. As Rural Lodge was the Lodge that had raised the question of illegitimacy, it seemed altogether fitting and appropriate that the Past Masters of Rural Lodge should participate in the ceremony of healing the Brother. Prior to the ceremony remarks were made by the D .D. G. M., Rt. Wor. Arthur C. Boyden, as to its significance, and his Warrant from the Grand Master was read in open Lodge. The ceremony consists in solemnly administering the several obligations of Entered Apprentice, Fellow Craft, and Master Mason, in a Lodge opened in form on the appropriate degree. The Entered Apprentice's obligation was administered by Wor. Bro. Henry L. Kincaide, the Fellow Craft's obligation by Wor. Bro. F. W. Brett, and the Master Mason's obligation by Wor. Bro. Joseph L. Whiton, all Past Masters of Rural Lodge. The Brother after the ceremony was in the position of a non-affiliated Mason in good standing, but before he could become a member of this Lodge it was necessary for him to make application for membership, be balloted upon, and secure a dimit from the Lodge that had improperly admitted him. On Sunday, December 28, 1902, a special communication was held for the purpose of celebrating St. John's Day. Three Lodges participated in the celebration, The Massachusetts Lodge, Rural Lodge, and Wollaston Lodge. After opening the Lodge, the Brothers present marched in procession to the Wollaston Congregational Church to attend a service conducted by Rev. Bro. Edward A. Chase, then the pastor of that church and Chaplain of WoUaston Lodge. There were present thirty-one members of The Massachusetts Lodge, thirty-six from Rural and sixty-three from WoUaston Lodge. This custom of celebrating St. John's Day, thus inaugurated by Brother Chase, has been continued to the present time. At the forty-fourth regular communication, May 5, 1903, the Master announced the death of Brother Charles G. Lee. who died on Sunday, May 3, 1903. In the passing of Brother Lee the Lodge lost a valuable member. He was one of our earliest initiates and from the time that he became affiliated he was greatly interested in the Lodge and ready, at all times, to support and assist any movement that would promote its welfare. On November 24, 1903, the Lodge was called together in special communication, and a Dispensation from the Grand Lodge was read, authorizing the forming of a procession to attend the funeral of Brother Albert H. Sayward, who was then our Senior Warden. The members, with sadness in their hearts, repaired to the Congregational Church, where the Masonic burial service was given in full form and symbolism. The portrait of Brother Albert H. Sayward which is hung in our ante-room was later presented to the Lodge by his widow. Let us cherish his memory. He was a fine type of man and an earnest worker in the Lodge. You will have noted that Wollaston Lodge was visited frequently by the Grim Reaper, during the early years of its existence, and always it was our finest flowers that were cut down. First Brother Bagley. then Wor. Bro. Neill. who had anticipated much pleasure in watching the growth and development of the Lodge which he had helped to establish, then Brother Lee. and a few days later Brother Sayward, who in a few short weeks would have been elected its Worshipful Master, an honor which he coveted and which the Lodge would have been pleased to bestow. It is a tribute to the inherent strength of all Masonic institutions that Wollaston Lodge was able so well to withstand the havoc created by the Scythe of Time. These institutions stand for and symbolize the Eternal Verities of life and are greater than the individual. During the years 1904, 1905, and 1906 nothing other than ordinary routine work was recorded by the Secretary. The Lodge continued to grow, but on the whole rather slowly. The growth reached its lowest ebb during the Masonic year ending August 31, 1905. That year there were only six initiates. At the May meeting in 1906, after the San Francisco cataclysm, the following vote was passed: That the sum of fifty dollars be forwarded to the Grand Secretary of Massachusetts for the relief of Masons and their families in California." At the annual meeting, December 4, 1906, Bro. Sidney F. Copeland was elected Master and installed the same evening by Wor. Bro. Albert W. Fay. The eighty-first regular communication, February 5, 1907, is conspicuous for one thing only. The Secretary records eighteen in attendance at the meeting. This is probably the smallest that ever attended a regular communication and was almost exactly ten per cent of our membership at that time. No doubt smaller percentages of membership were present at meetings in subsequent years. At the eighty-fourth regular communication, held May 7, 1907, a vote was passed authorizing the Secretary to have printed a directory of the members. This was done. For a short time we knew who our fellow members were and where to find them in person or by telephone. The matter of the Masonic Home was brought before us by Rt. Wor. Bro. Herbert P. French at the regular communication May 5, 1908. A rising vote was taken on the proposal that each member should contribute five dollars for the "Home." "Fifty-nine members and nine visitors voted in favor." About five hundred dollars for the Masonic Home was raised by voluntary contributions by members of the Lodge. At the ninety-eighth regular communication, November 3, 1908, the Lodge was honored by an official visit of the Most Worshipful Grand Master, John Albert Blake, who was accompanied by Wor. Bro. Edward Lawton, of Caleb Butler Lodge of Ayer, Mass. ; Wor. Bro. W. W. Osborne, of Adelphi Lodge, South Boston; Wor. Bro. G. B. Copeland, of United Brethren Lodge, Marlboro, and Wor. Bro. Smith B. Harrington, of Wollaston Lodge. The Most Worshipful Grand Master made a strong plea in favor of the proposed Masonic Home. The administration of Wor. Bro. Walter S. Pinkham began with the one hundredth regular communication of Wollaston Lodge, January 5, 1909. The one hundred and sixth regular communication was held August 3, 1909, in the Banquet Hall of Masonic Apartments. Opened at 7.30 p.m. Four applications for degrees read. Closed at 8.00 p. m. Twenty present. Brother Pinkham enjoys the unique distinction of being the only Worshipful Master who ever called Wollaston Lodge into regular communication during the month of August. At the one hundred and ninth regular communication Brother Tobey, chairman of the committee to solicit and receive contributions for the Masonic Home, reported that additional pledges brought the total to $912, of which $763 had been paid. Wor. Bro. Fay on behalf of the Past Masters guaranteed that the total subscriptions would be one thousand dollars. On February 16, 1910, during the second year of Wor. Bro. Pinkham's administration, a "Ladies' Night" was held in the apartments of Rural Lodge, in Quincv. This no doubt emphasized the fact that no suitable place for holding such functions was available in our own community. The administration of Wor. Bro. Charles E. Monroe began with the one hundred twenty-first regular communication. During this administration the Lodge pursued the even tenor of its way and made material progress in membership. During his first year twenty-nine members were added. At the one hundred thirty-first regular communication Wor. Bro. Monroe announced to the Lodge the appointment of Rt. Wor. Bro. Walter S. Pinkham as District Deputy Grand Master for this District. Brother Pinkham is the only member of Wollaston Lodge who, in the twenty-five years of its flourishing existence, has represented the Grand Master in that capacity. In March, 1912, a vote was passed for the appointment of a committee to procure a suitable gift for Orphan's Hope Lodge, of East Weymouth, which had suffered loss from fire. Daring the incumbency of Wor. Bro. Charles E. Cherrington, Worshipful Master during the years 1913 and 1914. the question of a new building was brought prominently before the Lodge on several occasions. At the eighty-first special communication the matter was discussed a?id a test vote was taken by slips to determine what amount could probably be raised by subscription. The slips showed a total of $4,080.50. The Building Committee was authorized to procure an option on a suitable site and to have plans drawn, and report to the Lodge at the next meeting. At the one hundred fifty-fifth regular communication May 5. 1914, a progress report was made, and "It was voted that the Committee be given power to purchase land on Beale Street for the benefit of the Lodge and pay on the same an amount not to exceed $300.00. It was also voted that the Building Committee be empowered to have plans drawn for a building costing about $20,000.00 above the land, not including furnishings." At the eighty-fifth special communication. June 16, 1914, the Building Committee made a report regarding the proposed building. It was voted, "That the meeting be resolved into a committee of the whole." The Chairman, Bro. Chester I. Campbell, explained the plans. It was voted, "That the committee of the whole be dissolved. . . It was then voted that the report of the Committee be accepted. . . It was then voted that a committee be appointed to proceed with the plans for building a Masonic Temple. It was also voted, "That the Trustees of Wollaston Lodge be authorized to invest from the Permanent Fund and other available funds, in Class B stock of the Building Association to be incorporated, as recommended in the report of the Building Committee, of June 16, 1914." From and after the date of the special communication at which the votes above recorded were passed. Wollaston Lodge was committed to the erection of a building; to be known as the Wollaston Masonic Temple. The history of that undertaking is rather the history of the Wollaston Masonic Temple Association than a part of the history of Wollaston Lodge. The construction of the Temple was begun during the second year of Wor. Bro. Cherrington's administration and completed during the first year of Wor. Bro. Carroll E. Bates' administration. The first meeting of the Lodge held in the Temple was the one hundred sixty-eighth regular communication, at which time a portrait of Wor. Bro. John F. Neill was presented to the Lodge. It hangs in the outer apartment. The date set for the dedication of the Temple was October 19, 1915, on which date a special communication, the ninety-second, was held. A banquet was served at 6.30 p.m., which was attended by the Most Worshipful Grand Master and his suite together with a large number of the members of Wollastbn Lodge and a few guests. At 8.30 p.m. the Grand Lodge was escorted into the Lodge-room and an address of welcome was made by Wor. Bro. Bates, which was responded to by Most Worshipful Melvin M. Johnson, Grand Master of Masons in Massachusetts, after which the Grand Master assumed the East and the Grand Officers were escorted to their respective stations by the Grand Marshal, R. W. Bro. William M. Farrington. The Temple was then dedicated by the Grand Officers in accordance with the ancient rites, customs, and ceremonies of Freemasonry. After the ceremonies were completed a dedicatory address was delivered by Rev. Bro. Isaiah W. Sneath. It was a most interesting occasion. There were more than three hundred in attendance including the Grand Lodge, members, and guests. At the following special communication the handsome clock which adorns the north side of the Lodge-room was presented to the Lodge by Wor. Bro. Charles L. Hammond on behalf of Rural Lodge. At the one hundred seventy-ninth regular communication Wollaston Lodge was again honored by the presence of Most Worshipful Melvin M. Johnson, Grand Master, who was present for the purpose of making a fraternal visit. The Grand Master made an address and presented a Henry Price Medal to Bro. Charles E. Pierce, of Rural Lodge. During the administration of Wor. Bro. Bates the Lodge first began to feel the full effect of the very great interest in Freemasonry caused by the World War. In his second year seventy new members were admitted which was more than double the number previously admitted in any one year. It was also during his term of office that the first suspensions for non-payment of dues became effective. During the term of office of Wor. Bro. John Morgan, who was Master for two years. 1917 and 1918. the Lodge continued to grow rapidly. Inside telephones were installed and a Chaplain's apron was presented to Rev. Bro. Sneath. Pie still continues to wear it with honor to the Fraternity. On January 1, 1918. the present Presiding Master was initiated. Tn just seven years he has reached the Oriental Chair. A remarkable record. At the one hundred forty-sixth special communication, December 10, 1918. the Henry Price Medal was presented to Bro. Alfred W. Thompson. For a second time this very honorable insignia was conferred within the body of Wollaston Lodge. "Our late Brother was not only a great figure in our national life rising as such above partisan limits, but as a Mason lie had intimate relations with this Grand Lodge. When he was raised our late Bro. Curtis Guild guarded the East Gate. He also took part in this Grand Lodge in the laying of the corner-stone of the Pilgrim Monument at Provincetown." Wor. Bro. Smith's term was chiefly remarkable for the extraordinary number of applications for degrees that were -received and the immense amount of work done. On one occasion thirty-eight applications were read. At one meeting there were twenty candidates eligible for the degrees, twenty applications were balloted upon, and twenty new applications were read. The influx was so great that it flowed over into the administration of Wor. Bro. Hugh H. Ralph. During Wor. Bro. Smith's term the Lodge voted one hundred dollars as a donation to the Salvation Army. At the annual meeting in December, 1919, the petition for a Dispensation to form a new Lodge in Wollaston, to be called Theodore Roosevelt Lodge, was approved, and at the same meeting it was voted, "That two years' dues of all members who were in the Army or Navy service be remitted. Wor. Bro. Hugh H. Ralph was Master during the year 1920. It was in his term that the number of special communications reached and passed the number of regular communications. It was also in his term that the flood of applicants reached its crest and began to ebb. The Grand Lodge returns show that for the Masonic year ending August 31, 1920, the number of new members admitted reached the extraordinary total of one hundred and twenty-three. It must be borne in mind, however, in considering these figures, that this total included those admitted during the last three months of Wor. Bro. Smith's term, and also included those that were admitted to membership by affiliation. During Wor. Bro. Ralph's term fifty dollars was contributed to the Y. D. Fund, a like amount was contributed to the Salvation Army drive, one hundred dollars for the Masonic Home was handed to Rt. Wor. Bro. Higgins, D. D. G. M., at the annual visitation, and at the two hundred nineteenth regular communication, December 7, 1920, our annual meeting, the Lodge gave, by voluntary contributions, $504 for the Washington Memorial, and in order to supply the needed quota, an additional contribution of $39.62. During the year 1920 there were ten regular and forty-four special communications or more than five times the normal number of meetings. During the Masonic year ending August 31, 1921, under the administration of Wor. Bro. Arthur B. Hillman, the number of members admitted was seventy-four; in the year under Wor. Bro. Albert D. Healey, the number admitted was forty-nine and the number reinstated one; in during the term of Wor. Bro. Edgar L. DeForest, fifty-five were admitted and two reinstated; in 1924, when our Junior Past Master, Wor. Bro. Herbert S. Fairclough, was at the head of the Lodge, fifty-five were admitted and one reinstated. From the figures given, it may safely be assumed that the extreme high-water mark for the admission of new members was reached in the year 1920. This record will endure for many years. In fact it is doubtful if it will ever be exceeded or even equalled. Many thoughtful Masons of high degree believe that during the past ten years the Blue Lodges have been admitting members too rapidly. Whether this view is sound or unsound is not a subject for discussion at this time. Looking at the matter solely from the standpoint of the material interest of Wollaston Lodge, the influx of new members for the past ten years has been of inestimable advantage to our Lodge. Without the revenue arising from degree fees and without the income accruing yearly from a large membership, Wollaston Lodge would have found it extremely difficult, if not impossible, to carry the financial burdens thrust upon it by reason of being obliged to assume indirectly the sole responsibility for financing the construction of the Temple in which we now hold our meetings. But even granting that we have admitted new members rapidly, and the same statement may truthfully be made of all other Blue Lodges wheresoever situated, Wollaston Lodge has a membership of which it may well be proud. Its personnel compares very favorably with that of any other Blue Lodge within the jurisdiction of this Grand Lodge. No review of the events of the past quarter of a century would be complete without emphasizing the fact that during this entire period Wollaston Lodge has had but one Treasurer and but one Secretary. Bro. 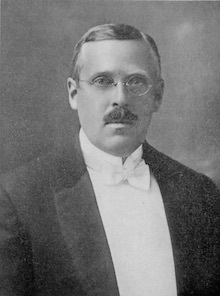 I. W. Pinkham was first appointed Treasurer by Wor. Bro. John F. Neill, Master Under Dispensation, and Bro. Edward E. Jameson .performed the duties of Secretary for the same period most acceptably, but felt that he would be unable to continue to devote the time which that office requires. At the meeting preceding the one at which the Lodge was Constituted, the Charter members elected Bro. Isaac W. Pinkham to be their first Treasurer and Bro. Alfred H. Richards to be their first Secretary and they were duly installed into their respective offices by the Most Worshipful Grand Lodge as a part of the ceremonies of Constitution. The Charter members builded better than they knew. Both of these important offices, and in many respects they are the most important in the Lodge, have been filled most acceptably by the original incumbents during the entire existence of Wollaston Lodge as a duly constituted body. May they long continue to go to and fro among us, and shed upon us the genial light of their kindly countenances. Wollaston Lodge has also been fortunate in its Chaplains. Rev. Bro. Edward A. Chase became Chaplain soon after the Lodge was Constituted and favored us by continuing to act in that capacity for ten years or more, during a part of which time he was also Chaplain of The Massachusetts Lodge. He is now serving the Grand Lodge ■ as one of its Chaplains. After Brother Chase our present Chaplain. Rev. Bro. Sneath, was appointed and has been reappointed each year. I will venture to say that these two Reverend Brothers, in addition to the other duties that devolve upon that office, have delivered a greater number of stirring, forceful, inspiring, and impressive charges to our candidates than have been delivered in any other Blue Lodge within the Commonwealth of Massachusetts during the same time. Wollaston Lodge during the past twenty-five years has accepted nine hundred and eighty-five members, reinstated four, and rejected seventy applicants. Ninety-one have dimitted, sixty-three have died, and twenty-three have been suspended or discharged from membership. Its membership at the close of the last Masonic year was eight hundred and one. At the annual communication in December 1924, its membership was eight hundred and eleven. It has paid the Most Worshipful Grand Lodge in regular dues $4,460, and in assessments for the support of the Masonic Home $2,840, also its full quota and more to the Rainy Day Fund and the Washington Memorial. In all respects its career has been most honorable and praiseworthy. May il continue to nourish for countless years to come, and may it continue to maintain its individuality and prestige in the community in which it was established. "Stand in the old ways. Consider them well and be not among those who are given to change." By Worshipful J. Henry Johnson. The history of the first twenty-five years of Wollaston Lodge was extensively and efficiently presented by the late Worshipful Brother Eugene F. DeNormandie, and is now a matter of Masonic record in "The Proceedings of the Grand Lodge of Massachusetts, A. F. & A. M., 1925." No enlargement on this history seems necessary with the exception of references where occasions may require. This history is the chronology of the last twenty-five years leading up to this Fiftieth Anniversary. Over fifty years have elapsed since the petitioning of Rural Lodge of Quincy to form a new Lodge in that section of Quincy called Wollaston, and the granting of dispensation to the forty-three petitioners by the Most Worshipful Charles C. Hutchinson, Grand Master of Masons, under his hand and seal on January 2, 1899. It is interesting to note that the original founders of Wollaston Lodge were of a single mind that a new Lodge was necessary because "Wollaston or Wollaston Heights was making very material growth in population" and that "as a community it was destined to occupy a position of constantly increasing importance." In this present day we can now see the wisdom that these Brethren displayed inasmuch as the community of Wollaston has grown to become one of the largest and most populated sections of Quincy. The need of a "new lodge" has also been borne out by the records of Wollaston Lodge which show that the Lodge has grown from the original forty-seven members to a peak of 857 members during the years 1927 and 1928. In the year 1925, at the start of the twenty-sixth year of its existence, Wollaston Lodge had resumed its normalcy following the great dilemma of World War I, and the large classes of candidates had tapered off considerably. It was early in this year, under the direction of Worshipful Brother William M. Haskell, that the twenty-fifth anniversary was celebrated with appropriate ceremonies, including a visit by Most Worshipful Dudley H. Ferrell and his distinguished suite. In the following year, 1926, under the direction of Worshipful Brother Earl D. Gilliatt, Wollaston Lodge was honored by another Grand Lodge visit made by Most Worshipful Frank L. Simpson and his suite. In the year 1927, the twenty-eighth year of the Lodge, during the term of Right Worshipful James S. Collins, when the peak of membership had been reached, the records indicate that Wollaston Lodge grew in stature in its Masonic precepts by enacting adequate By-Law regulations relating to the Welfare Fund of the Lodge, thereby taking care of all charitable and benevolent cases. Right Worshipful Brother Collins was later appointed District Deputy Grand Master of the Twenty-sixth Masonic District by Most Worshipful Joseph Earl Perry, and served in that capacity during the years of 1938 and 1939. He thus became the second member of Wollaston Lodge to be so honored. During the years 1928 and 1929, under the leadership of Worshipful Brother Frank A. Lincoln and Worshipful Brother Rodney P. Gallagher, both very capable ritualists, much was done to stabilize the finances of the Lodge. In the year 1930, with the advent of the thirty-first year, Wollaston Lodge was graced with a Worshipful Master who had served in World War I, and who later distinguished himself in the service of his country in World War II. This reference is made to Worshipful Arthur I. Burgess, then a member of the Massachusetts House of Representatives, serving the citizens of Wollaston. Worshipful Brother Burgess had many interesting and varied meetings and brought many distinguished visitors to Wollaston Lodge, including law enforcement officers, members of the House of Representatives and of the Senate. Of particular interest was the visit of the then Senate President, Samuel Holmes Wragg, who later became the Grand Master of Masons in Massachusetts, and at present, Sheriff of Norfolk County. The year 1931 marked the start of the great depression, which took its toll of Wollaston Lodge members. This decline in membership continued gradually with each succeeding Worshipful Master encountering the same difficulties, with many calls or relief. Faithfully serving during these years were Worshipful Brothers Albert H. Waite, Frank W. Crimp, Elmer F. Atwood, Leland F. Beal and George C. Tribble. The year 1936, the thirty-seventh year of the Lodge, found Worshipful Brother Paul B. Morrison presiding. Worshipful Brother Morrison, during those trying days, did much to cement the brotherly love and affection of the Lodges in the 26th Masonic District by means of the officers visiting the various Lodges and exemplifying the Masonic Degrees. This fine gesture resulted in return visits to Wollaston Lodge. Worshipful Brother Morrison did considerable relief and chari-:able work also. He later served under Right Worshipful James S. Collins and Right Worshipful Raymond C. Warmington, an Honorary Member of Wollaston Lodge, as Marshal for the 26th Masonic District. He also served with Right Worshipful Brother Warmington while the latter was Deputy Grand Master during the year 1947. In this same year, 1936, it was apparent that the Wollaston Masonic Temple, as a result of the Depression and the insufficiency of income, would eventually undermine the financial structure of the Lodge, and legislation vas started toward the eventual sale of the building. During the thirty-eighth year of the Lodge, in the year 1937, :he then Worshipful Master, Joseph D. Gardner, was authorized by the Lodge to accept offers for the purchase of the Wollaston Masonic Temple. This action was indeed a hard blow to swallow, yet the dictates of prudence and plain business left no other course open. Worshipful William E. Mullin, who presided in 1938, the thirty-ninth year of Wollaston Lodge, brought about a reformation of our By-Laws pertaining to members who automatically became life members after having been a member of the Lodge or twenty-five years. It was apparent that in the long run the Lodge would be top-heavy with life or non-paying members. This condition was changed by adequate by-law regulations and the Lodge finances thus stabilized. Worshipful Brother Mullin also presided at a time when the largest Masonic gathering ever held in this Masonic District was held at the Quincy Masonic Temple, on the occasion of the reception to the Most Worshipful Joseph Earl Perry, Grand Master of Masons in Massachusetts at that time. I would be remiss in this history if I did not state that this meeting was a result of the efforts of Right Worshipful Brother James S. Collins, who served as District Deputy Grand Master of the 26th Masonic District at that time. He rallied together over 600 Masons in the District who were present at dinner and the reception, and which occasion was commemorated by a special edition of the Quincy Patriot Ledger, largely through the efforts of the late beloved Brother George Rhodes. In the year 1939, during the term of the late Worshipful Brother Waldo B. Fay, who was the son of Albert W. Fay, the first Worshipful Master of Wollaston Lodge following its Constitution, the final sale of the Masonic Temple was consummated. It was also during this year that another great 26th Masonic District meeting was held as a result again of Right Worshipful Brother Collins, this occasion being a testimonial to the late Right Worshipful George E. White, the then Senior Grand Warden of the Grand Lodge of Masons in Massachusetts. Another pleasant duty of Right Worshipful Brother Collins is recorded in records of this year, namely: the presentation of the Joseph Warren Medal for Distinguished Service to our esteemed Secretary, Brother Alfred Howe Richards. A note of sadness comes into this fortieth year of Wollaston Lodge in the passing of one of the most beloved clergymen in Quincy, and the Chaplain of Wollaston Lodge. Reference is here made to Reverend Brother Dr. Isaiah Witmer Sneath, who served the Lodge as its Chaplain for nearly twenty-seven years, and who passed to the Celestial Lodge above while in his eighty-fifth year, on November 1, 1939. Reverend Brother Dr. Sneath's familiar quotation from Hamlet by Shakespeare, "This above all, — to thine own self be true, and it must follow, as the night the day, Thou canst not then be false to any man," was frequently quoted in his Masonic Charges and addresses and will long be remembered by all who were privileged to hear him. The trying days of the depression having passed during the late thirties, Wollaston Lodge settled down to normalcy during the early forties. This normalcy, however, was of short duration because in the year 1940, the forty-first year of the Lodge, during the tenure of Worshipful Brother Clark H. Overhiser, our Country was already embarking on a program of preparedness with bond drives and maneuvers of a military nature, and the sinister shadow of war again making its presence known. During the year 1941, this same condition existed. However, Worshipful Brother Ralph E. Palmer found himself not only busy presiding, but also doing the work of our late Secretary, Brother Alfred H. Richards, who had suffered a heart attack. It was during Worshipful Brother Palmer's year that the true financial picture of the assets of Wollaston Lodge was projected at the Annual Meeting by the elimination of the worthless stock held by the Wollaston Masonic Temple Association from the Annual Report. In the forty-third year of Wollaston Lodge, during the term of Worshipful Brother J. Henry Johnson, came another note of sadness in Wollaston Lodge, with the passing of our beloved Secretary, Brother Alfred Howe Richards, who was a Charter Member of Wollaston Lodge, and its first Secretary, a position he faithfully held for forty-two years. Brother Richards entered the Celestial Lodge above while in his seventy-fifth year, on November 4, 1941. Following this shock, came the abominable attack on Pearl Harbor by Japan on Sunday, December 7, 1941, which precipitated World War II. The Worshipful Master found it necessary to procure dispensation from the Grand Lodge to hold the meetings of the Lodge in the Town of Milton, this action being necessitated by the Army taking over both the Quincy and the Wollaston Masonic Temples for quarters. Again the true spirit of fraternalism and affection was shown by the neighboring Macedonian and Milton Lodges, who cooperated so wholeheartedly and did about everything to make the temporary stay of Wollaston Lodge in Milton so pleasant. It was also during this year that Worshipful Brother Ralph E. Palmer, who had so ably assisted our late Secretary, Brother Alfred H. Richards, was elected as the second Secretary of Wollaston Lodge, which office he still holds with much honor to himself, to Wollaston Lodge and to the fraternity. With the advent of World War II, Wollaston Lodge, in the year 1943, the forty-fourth year of the Lodge, found Worshipful Brother Clarence P. Churchill very busy due to the influx of candidates. This year also marked the upward trend again of the Lodge membership, which has continued right up to the present. Busy years followed, with numerous meetings, conferring of degrees, entertainments and social events, and excellent fraternal spirit shown at all times. The Worshipful Masters who presided during these years were Worshipful Brothers Frederick S. Tobben, John W. Cushman and Leonard K. Thomas. In October 1944, on the occasion of the public installation of officers of Wollaston Lodge, another pleasing event took place with the presentation of the Joseph Warren Medal for Distinguished Service to Right Worshipful James S. Collins by Right Worshipful Raymond C. Warmington, District Deputy Grand Master at that time. In the year 1947, during the term of Worshipful Brother Ervin A. Hinds, a significant event is recorded, namely: the commemoration of the twenty-fifth Masonic Anniversary of our beloved Chaplain, Reverend Brother Victor V. Sawyer. At this occasion Reverend Brother Sawyer was presented the Joseph Warren Medal for Distinguished Service by the then Deputy Grand Master, Right Worshipful Raymond C. Warmington. This meeting brought forth one of the largest aggregations of Masonic Brethren ever to be assembled in the lodge-room to pay tribute to a man loved and respected by all in the community. The advent of the forty-ninth year of Wollaston Lodge, in the year 1948, found Worshipful Brother William Low, Jr., establishing an enviable record for Wollaston Lodge by having the largest number of officers and members present at the Twenty-sixth Masonic District Exemplification, with forty-three officers and members present. He also established the fine record of having the largest average attendance of officers at the Lodge of Instruction meetings. On April 13th our Treasurer, Brother Harry N. Thomas, was presented a fifty year Veteran's Medal by our District Deputy, Right Worshipful Warren G. Osgood. Brother Thomas was appointed Treasurer of Wollaston Lodge in December, 1940, elected its Treasurer in September, 1941, and has served the Lodge faithfully in that capacity to the present time. Thus we come to the fiftieth year of Wollaston Lodge, on this April 27, 1949, under the capable leadership of Worshipful Brother C. Fred Ericson, with a fine line of officers and with a present membership of 707 Brothers. All through this history and the years it has been demonstrated that the high standards established by our founders and worthy successors have been maintained, and have thus worthily justified the existence of Wollaston Lodge which our forebears had in mind when they founded Wollaston Lodge fifty years ago. The history of this fiftieth anniversary will be left for a future Historian. Our growth has been healthy and useful. Thus may the records of Wollaston Lodge in the future attest, as in the past, our endeavors to practice in Unity and Brotherhood all of our Masonic Virtues. By Worshipful Kenneth A. Hamilton. "History", according to The Random House Dictionary of the English Language, is "a continuous, systematic narrative of past events as relating to a particular people, country, period, person, etc." A true history of Wollaston Lodge, therefore, would be the story of not only the sixty-six men who have served the Lodge as Master during the past seventy-five years but also that of every Mason who has contributed to the success of the Lodge over the same period and would fill volumes. This history will, therefore, be an attempt to relate the events leading up to the institution of Wollaston Lodge and its first year of existence. As the end of the nineteenth century approached, the City of Quincy was experiencing a marked increase in population, especially in that section of the City then known as "Wollaston Heights". Expressing their confidence that this growth would continue, thirty-eight Master Masons, on October 6, 1898, presented to Rural Lodge, A. F. & A. M. a petition asking permission to institute a Lodge at Wollaston. At its regular communication on November 3, 1898 Rural Lodge granted the petition "after due notice . . . and in accordance with Masonic Laws". The District Deputy Grand Master of the 24th Masonic District, R. W. Charles B. Lawrence, concurred with the action taken by the members of Rural Lodge and forwarded the petition to the Grand Lodge with his recommendation that it be granted. On January 2, 1899, Most Worshipful Charles C. Hutchinson, Grand Master of Masons in Massachusetts, ". . . reposing full confidence ... in the Masonic integrety and ability of the petitioners . . ." granted the dispensation ". . . to form and open a Lodge after the Manner of Ancient Free and Accepted Masons, according to the ancient customs, and not otherwise . . ." in the Wollaston section of the City of Quincy, appointing Brother John F. Neill, Master; Brother Albert W. Fay, Senior Warden; and Brother Eugene F. DeNormandie, Junior Warden. 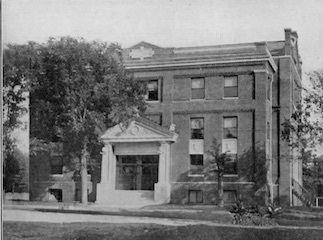 The question as to whether or not the new Lodge would be successful was answered in part at its first Regular Communication on January 10, 1899 when applications for the Degrees were received from fifteen candidates. During February, 1899 the fledgling Lodge held two meetings, conferring the Entered Apprentice Degree on five candidates at each meeting. The second Special Communication of the Lodge was held on March 7th with a First Degree on three candidates. On March 14th, at the third Regular Communication, four candidates were advanced to the Degree of Fellow Craft. This meeting saw the appointment of two committees, one to explore the possibility of obtaining a new building for the Lodge and the other to arrange for a Ladies' Night. The Brethren in attendance at the March 21st meeting witnessed a Second Degree on five candidates. Three meetings were also held during April. The first, a Second Degree on three candidates took place on April 4th. Seventy-one Brethren attended the fourth Regular Communication of the Lodge on April 11th and witnessed the raising of three candidates to the sublime degree of Master Mason. The largest number of members of the Fraternity to attend Wollaston Lodge during its first year of existence gathered together on May 18th when one hundred and ten Brethren were joined by twenty-nine members of the First Worshipful Master's Association who ". . . came from Boston on a special car attached to the 7:38 P.M. train from the Union Station". Five candidates were advanced to the Master Mason Degree at this meeting with music furnished by the Temple Quartette. The fifth Regular and sixth Special Communications of the Lodge were held during the month of May; the former, a First Degree on five candidates and the latter, a Third Degree on three candidates. May also brought the first Ladies' Night in the history of the Lodge which was held on May 13th with eighty-five in attendance. Light refreshments were served and those present danced to the music of the Boston Ideal Banjo and Mandolin Club. A committee to formulate the By-Laws of Wollaston Lodge was appointed at the sixth Regular Communication on June 13th as was a committee to investigate the report of a Brother in need of assistance. By permission of the Grand Master, the Lodge conferred both the Fellow Craft and Master Mason Degrees on five candidates at this meeting. As is the custom today, the Lodge was in darkness during the months of July and August. When the Lodge was called to labor again on September 12th the By-Laws Committee submitted its report which was accepted by the members and discussion was planned for a future meeting. October saw the adoption of the By-Laws of the Lodge after much discussion. The building committee was also kept busy investigating the offer of a building at the corner of Hancock and Beach Streets. The ninth Regular Communication of the Lodge was held on November 14, 1899 at which time the Entered Apprentice Degree was conferred on two candidates. Following the degree work, elections, to fill the officers of the Lodge for the ensuing year were held. On November 28th the first Annual Meeting of the Lodge was held at which time various reports were read and accepted by the membership. It was also voted "that the Wor. Master-elect, appoint such committees as might be deemed expedient and that the said committees be given full power to arrange for the Constitution and Installation". The accomplishments of the sixty-six Masters who have served Wollaston Lodge during wars, peace, and depression, and whose dedication for their fellow man was shown in their inspirational leadership remain a permanent part of the records of Wollaston Lodge and the Grand Lodge of Massachusetts. The Masons of Wollaston, Mass. deserve hearty praise for their courage and loyalty in erecting a Masonic Temple for the home of Wollaston Lodge. Such an undertaking usually has the support of several bodies. This Temple, with Wollaston Lodge for its only Masonic occupant, was erected by the "Wollaston Masonic Corporation" of which Mayor Chester I. Campbell is president. The Temple was dedicated by the officers of the Grand Lodge, Tuesday, October 19. A handsome souvenir program presented the "Order of Exercises" which began with reception of M. W. Melvin M. Johnson, grand master, following which prayer was offered by the Rev. Edward A. Horton, Grand Chaplain of Massachusetts, after which there was a response by a male chorus. E. W. Campbell, the architect, surrendered the working tools, and Worshipful Master Carroll Bates delivered an address to the Grand Master, requesting that he dedicate the building to the principles of Free Masonry. Grand Master Johnson responded briefly and proceeded to the dedication ceremony. First came the examination of the building and the ceremonial dedication to Free Masonry, virtue and universal brotherhood. The Grand Chaplain offered prayer, and the grand master made the usual proclamation, in which he declared the hall dedicated to the purposes and aims of Masonry. "Masonry is to strengthen the union and brotherhood between Masons and men; to cultivate a true patriotism in the political life of the nation and righteousness in the social and commercial relations of society. "We are called upon to render a more important service. The greatest demand of the next several decades will be for manhood — men of calibre, character and ability for leadership. The fearful decimation of the lives of the noblest of Europe's sons by the slaughter of war means that America must furnish the prepared men. The American young men today ought to be sitting upon the front bench, learning the high ideals and fitting themselves to be leaders in the coming movements for the realization of those ideals. Only the men possessing the highest type of manhood will be able to bring order out of the present chaotic conditions and leave humanity on a higher plane of existence. "It is my conviction that the fundamental purpose of a genuine Masonry is the development of such a manhood." "Ideal mankind can never be developed in solitude. It is not good for a man to live alone. Society is a normal condition; asceticism is abnormal. Man needs and covets the fellowship of his brother man. And yet in the midst of the strenuous and shifting life of today this fellowship is most sadly lacking." At the close the dedicatory hymn was sung and the exercises were brought to an end with prayer by the Grand Chaplain. The dedication was preceded by a banquet. The Temple is two stories high with a basement. The exterior is of tapestry brick, terra cotta and Spanish tile and presents a dignified and substantial appearance, while the interior in coloring, equipment and ornament entire is artistic. The first story is devoted to the Public auditorium, with a floor and balcony capacity of over 500; a modern stage with several sets of the highest grade scenery, electric stage devices, velour arch curtain, all flame Proof, separate dressing rooms, etc., occupies the width of the building. Ladies' checking and social rooms are also provided for this, and the mezzanine floor. Four emergency exits make the building a thoroughly safe one. The basement is finished off as a banquet hall for fairs, sales and minor occasions. Adjoining the large room, which has a seating capacity for dining of 350 or more, are storage rooms, kitchen, checking and toilet rooms; this also has four exits in addition to stairs. The apartments of Wollaston Lodge comprise large toilets in the basement, checking room on the mezzanine floor on stairs to the lodge quarters, and on the second floor one of the most complete equipments for the purpose to be found in a building of this size. Smoking rooms with adequate ventilation, ante-rooms, master's room and others in addition to the lodge room proper, which is 40x26 feet. The arched ceiling is beautifully decorated, the lighting effects of a very high order and the furnishings as designed and now being made to order will finish a building in which the Masonic fraternity may well take pride. The building was designed by E. W. Campbell, architect, of Boston. The cost of the temple was $40,000. The building committee was composed of Brother Chester I. Campbell, Brother J. Arthur Sparrow and Brother Stephen B. Wiley. The officers of the lodge are: Carrol E. Bates, Master; John Morgan, Senior Warden; George A. Smith, Junior Warden; I. Woodbury Pinkham, Treasurer; Alfred H. Richards, Secretary; Rev. Isaiah W. Sneath, Chaplain; Roderick D. Hall, Marshal; Hugh H. Ralph, Senior Deacon; Arthur B. Hillman, Junior Deacon; Charles B. Hoxie, Senior Steward: Elbert H. R. Gardner, Junior Steward; Albert D. Healey, Sentinel; Herbert Y. Follett, Organist; and William P. Chase, Tyler. Grand Master Melvin M. Johnson paid a fraternal visit to Wollaston Lodge of Wollaston, Mass., at its regular communication, Friday evening, November 7th, the occasion attracting an unusually large attendance of members and visiting brethren. Following an excellent dinner served at seven o'clock, Grand Master Johnson was formally received and welcomed by Worshipful Master Carroll E. Bates. After the work of the evening had been dispatched Grand Master Johnson gave an eloquent and interesting address on the beginning of Freemasonry in this country and of the first Grand Master Henry Price who is rightly called the "founder of duly constituted Masonry in America." Referring to the latter he said that the Grand Lodge had caused a bronze medal to be struck in commemoration of Henry Price which the Grand Master was authorized to present any Master Mason in the jurisdiction who has attained fifty years membership. He said there was one present who was entitled to this honor and he requested the Grand Marshal to present Brother Charles E. Pierce, a member of Rural Lodge, Quincy, Mass., since August, 1864, when he was raised under dispensation, being at that time at home on sick leave from the Army of the Potomac. The Grand Master honored Brother Pierce by placing the medal upon his breast, accompanying the act with impressing and fitting words to which the recipient made appropriate response. The address of the Grand Master to the Lodge was received with prolonged and hearty applause. A complimentary banquet was tendered by Wollaston Lodge to World War Veterans on the evening of Wednesday, April 11th which was largely attended. The occasion was a notable one. It showed that although five years had passed since hostilities has ceased the members of Wollaston lodge had not forgotten the sacrifices made by its members during those trying days when they left homes and families and went overseas to do their bit toward the preservation of democracy and the beloved flag. On the membership rolls of the lodge there are more than a hundred who received their Masonic degrees in Wollaston Lodge. Many of these are still residents of Quincy. Others have removed to other cities and towns, although still carried on the rolls of Wollaston lodge. Many of these brothers were present and occupied seats in the center of the lodge room during the exercises which followed the banquet. The evening opened with a banquet served in the lower hall which was all that could be desired. Previous to the banquet the participants gathered in the lodge room and led by Worshipful Master DeForest, marched to the banquet hall. The guests of the evening seated at the head table, included Gen. Edwards, Adj. Gen. Jesse F. Stevens, Lieut. Allan Cherry, of Providence, one of the charter members of the Overseas Lodge instituted in Coblenz, Germany, by the army of occupation after the armistice was signed, Lieut. Debs of the U. S. Marines, Col. Warren E. Sweetser, Rev. Landries, chaplain of Joseph Webb Lodge and Rev. Dr. Isaiah W. Sneath, the beloved Chaplain of Wollaston Lodge, without whose presence no gathering of this lodge would be complete. Following the dinner, and while cigars were being enjoyed, there was some community singing. Songs familiar at all gatherings during the war were sung as well as some that have come into popularity since. Then all again assembled in the lodge room where the evening's program was continued with Bro. Arthur W. Robinson as toastmaster, who introduced W. M. Edgar L. DeForest. Wor. DeForest briefly welcomed the guests and brothers. He told the service men that their presence was much missed during the war. He praiaed the loyalty and sacrifices and devotion of the brothers for the preservation of our great republic and the peace of the world and assured them the lodge would never forget what they did over there. Then followed the singing of the Star Spangled Banner, led by the Harvard Quartet, after which the exercises formally opened with prayer by Dr. Sneath and the toastmaster read letters of regret at inability to be present from Gov. Cox, Lieut. Gov. Fuller, Vice-President Calvin Coolidge, from the secretary to President Harding, Sec. of Navy Denby, Sec. of War Weeks, Col. Foote and Col. Hyatt of Gen. Edward's staff. General Clarence R. Edwards who commanded a division in France and who is a member of Euclid Lodge, Boston, also spoke. The first speaker was Dr. Sneath. He said the reason he was not across during the war was because he was too old, but he did what he could at home. He said that while the boys were absent, those at home always had the soldiers in mind, and their letters were read with great interest. He also spoke of one who had made the supreme sacrifice. "You boys," he said, "fought for a world democracy, for the freedom of the world, you helped Belgium, England and France fight for the preservation of a great republic and you did well. Your work will be remembered to the end of time." He also said there was great opportunity in the future to fulfill the vision of the twentieth century to do away with autocracy and establish democracy. The toastmaster said that out of 700 members, over 100 had seen service in the great war. The first Quincy boy to go overseas was a member of Wollaston Lodge. Adj. Gen. Stevens paid a tribute to the service men who, he said, had been true to the traditions of New England in the finest way. It was good to see that fine old spirit, a spirit which was needed more than ever at the present time. He also said a good word for the National Guard and congratulated Quincy on obtaining favorable action for the new armory. Lieut. Cherry told of the formation of the Overseas Masonic lodge by the Army of Occupation, and how it had grown. The lodge, he said, is now located in Providence. The work was done by lodge officers in uniform, none but overseas men being eligible for membership. He said that while in Germany, 3200 Masons from 58 divisions had been enrolled. Lieut. Debs, of the U. S. Marine Corps spoke briefly. He told of meeting the Yankee Division boys going in as his branch was coming out from the front line trenches, that his command had remarked the great spirit shown by those boys going forward. It was a spirit that could not be downed. Rev. Bro. Landers of Joseph Webb Lodge also had a word of praise for the New England soldier and said there was need today of just such spirit. Colonel Sweetser, whose name is familiar to every one in Quincy, was given a warm welcome. He spoke briefly and in a happy vein He told of the need of the United States being prepared. This page was last modified on 24 September 2018, at 13:58.